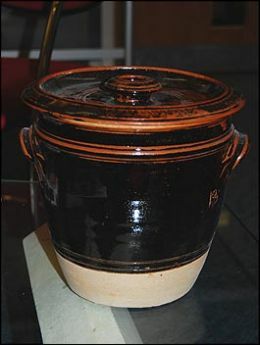 Guernsey Bean Jar has been part of island life for centuries. It is said that in the past the bakers of Guernsey used to let islanders put their prepared bean jars in the warm ovens overnight after they had finished cooking the bread. By the morning they were well cooked and ready to collect. Many islanders ate the dish for breakfast until around the 1920s. Today though it is more associated as tasty winter fayre much loved on Bonfire Night, or as it’s known locally ‘Budloe Night’. 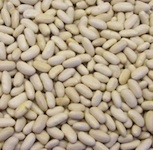 It tastes great but the inclusion of so many beans may mean that you’ll be making fireworks of your own! Cover the jar or dish and place it in a moderate oven at gas 2-3 or 150-170°C for 6-8 hours. Serve with crusty bread and Guernsey butter. Bean Jar was never a delicacy but a cheap wholesome winter meal mostly enjoyed by people living close to the bakers ovens! 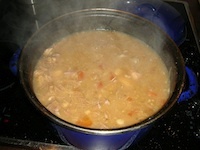 Traditionally the dish would be started on the Friday night with the soaking of dried beans. Next day, Saturday cheap cuts of meat would be bought (normally pigs trotters). 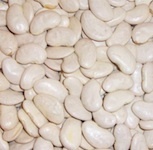 Beans and meat would briefly be boiled and transferred to a pottery jar “the Bean Jar” this would be covered with thick brown paper tied with string and marked with the family name. This would be taken to the nearest bakery and the jars put into the cooling oven as no bread was baked on the Sunday. In the morning the cooked Bean Jar was collected and the baker was paid per jar. The Bean Jar was then stored and eaten on Monday, washing Day, as the women were too busy washing clothes to cook and normally reheated the jar on Tuesday because this was ironing day.